Before them fire devours, behind them a flame blazes. Before them the land is like the garden of Eden, behind them, a desert waste - nothing escapes them." During the reign of Solomon, the world was bedeviled with creatures that plagued mankind. Attacking from land and sky, these beasts dwelt in the shadows and hunted men like animals. One of these Nephilim, as they were known, was named Algar. He commanded a host of daemons and spirits that rampaged through the kingdom of Israel and beyond. Many tried to stand against him, but all failed, paying the price for their failure as their souls were ripped from their bodies to roam the ether in torment until a wise magus imprisoned Algar within the Gates of Flame. for 2000 years, the hidden servants of Algar have sought the fiend's release, and only the Witch Hunters stand in the way. 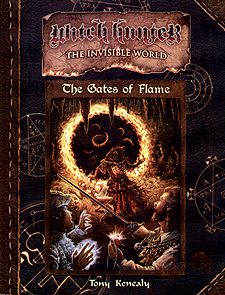 The Gates of Flame" is an exciting adventure perfect to test the mettle of a cadre of hardened Witch Hunters.